Hello everyone!! Just popping in for a couple of reminders. First, today begins the voting for the Digital Art Contest at Crafter's Digital Art Center, and if you have a minute, my sweet friend, Kallista would sure appreciate YOUR vote. Just log on to the CDAC website, and if you're not a member, you'll have to sign up. Then go to the Digital Drawing Contest page, and vote for Kallista Kelly under the Ametures, Beginners, or Hobbyist category. That's it! There are a lot of wonderful entries, and you have one week to cast your vote!! 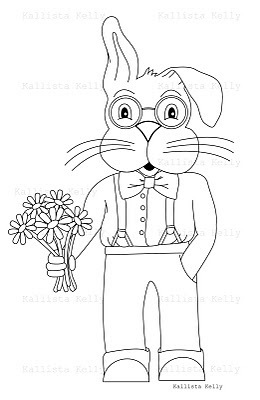 Here's a look at Kallista's Harrison Hare digi. Thanks so much for your vote and support!!! We appreciate it sooooo much!!!!! 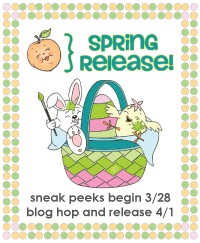 Now, my second reminder is that there have been sneak peeks for the new Peachy Keen Stamps release going on for the past couple of evenings, and if you haven't had the chance to check them out, you've just GOT TO!! 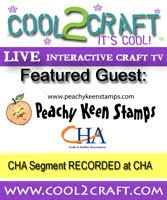 Head over to the Peachy Keen Stamps Blog and check out the sneaky peeks. Follow the links to my fellow DT blogs for your chance to win the stamp set they're showcasing! This is one fantastic release, and I'll have a sneak peek of the new Hillbilly Holler line for you at 7 p.m. tonight. I also have a free stamp set to give away to one lucky commenter. We're doing things a little bit different this time, and the winner will be chosen from the sneak peek comments instead of the blog hop comments. So if you'd like the chance to win the first ever release of Hillbilly Holler stamps, illustrated by Steve Yarbrough, be sure to stop by and leave me a comment tonight. There won't be much time to enter, and you're definitely NOT going to want to miss this!!!!! See ya tonight!!!!!! Thanks for stopping by today! I'm looking forward to seeing you tonight, and I can't wait to hear what you think of Hillbilly Holler!!!!! Have a good one and I hope you get to enjoy some happy stamping today! I voted!! Go Kallista!! Woohooo! Thanks for the reminder! I just voted for her! I think they were all really cute and quite creative.